PT4270. Prototype lens, released by GOI in 1972 (?). Focal length - 4.7 cm, aperture controled by external metal strip with round holes of different sizes. Focusing range from 0.8m to infinity. Number of elements/groups: unknown. Angular field - 46º (unconfirmed). Zorki (M39) mount. 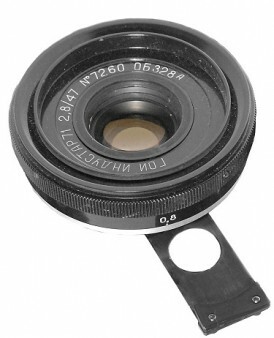 An earliest so far known lens has s/n #7259 (PhotoHistory.ru). Would be happy to know more about the particular lens. Lens #7260 opposite from Viktor Suglob (Belarus) collection. PT4270 - Industar-71 prototype lens #7260.